Default - BankCheck.xml - captures the account number and routing number from the machine-readable zone (MRZ) of a check. Default - Barcode1.xml - decodes a single barcode of any symbology. Default - Barcode10.xml - decodes 10 barcodes of the same or differing symbologies. Default - Barcode2.xml - decodes two barcodes of the same or differing symbologies. Default - Barcode4.xml - decodes four barcodes of the same or differing symbologies. This is the default template if none is selected. Default - Barcode5.xml - decodes five barcodes of the same or differing symbologies. Default - BookNumber.xml - decodes 10- or 13-digit ISBN codes. 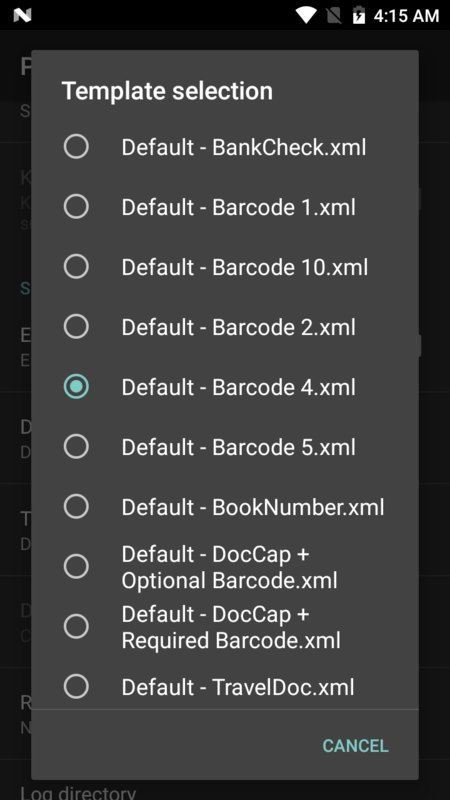 Default - DocCap+Optional-Barcode.xml - captures the form as an image and optionally decodes a barcode, if present. Default - DocCap+Required-Barcode.xml - captures the form and decodes any available barcode. Default - TravelDoc.xml - captures information from the machine-readable zone (MRZ) of a travel document such as a passport. Default - Unstructured Multi-Line.xml - uses OCR to acquire multiple lines of alpha/numeric text. Default - Unstructured Single Line.xml - uses OCR to acquire a single line of alpha/numeric text. To add custom templates to the list above, copy the template XML files to the /enterprise/device/settings/datawedge/templates directory. Dynamic Template Params – permits the configuration of parameters when using Dynamic Templates. This offers the flexiblity of accepting input parameters based on varying usage scenarios without requiring a different template for each. If the selected template contains Dynamic-Template parameters, DataWedge prompts the user to configure the parameters. Currently supports Dynamic Quantity, which sets the number of barcodes (from 1-99; default=5) to be decoded on a form. Dynamic Templates are created using Template Builder. Region separator - used to configure a separator character for SimulScan text-region data (see Notes, below). When multiple text regions exist, the region separator is inserted between the data strings from each region on the acquisition form. Region separators can be used with the Keystroke Output Action key character settings to dispatch SimulScan region data to separate text fields. Barcode, OCR and OMR regions are considered text regions. When using keystroke output and/or IP output, only text-region data are dispatched to the foreground application or to a remote server. Picture-region data (images) are retrieved only through Intent Output. 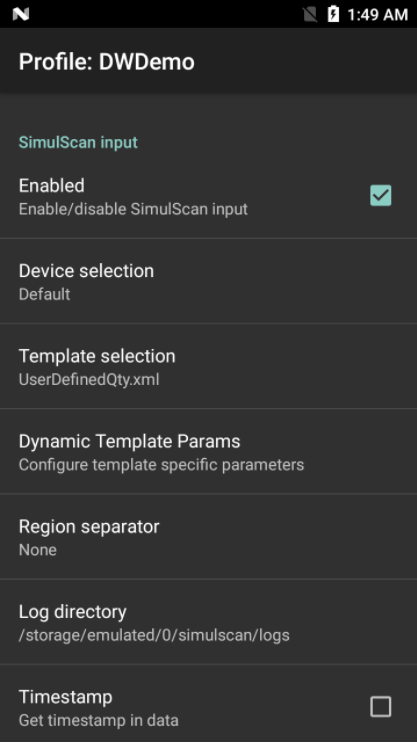 If Barcode Input is enabled in a Profile, enabling SimulScan in that Profile causes the Barcode Input Plug-in to be disabled. String SIMULSCAN_TEMPLATE_NAME_TAG = "com.symbol.datawedge.simulscan_template_name"; The name of the template used by SimulScan to capture the form. String SIMULSCAN_REGION_NAME_TAG = "com.symbol.datawedge.simulscan_region_name"; Returns the region name of the bundle object for reach region. Call Bundle.getString() to get the region name. String SIMULSCAN_REGION_ID_TAG = "com.symbol.datawedge.simulscan_region_id"; Returns the region ID of the bundle object for reach region. Region ID is an integer and is retrieved by calling Bundle.getInt (). String SIMULSCAN_REGION_BINARY_DATA= "com.symbol.datawedge.simulscan_region_binary_data"; Returns the data of the region in the form of byte array. Binary data comes only for picture regions and the form image. Both picture and form data are loaded in to a bitmap and display in the application. String SIMULSCAN_REGION_TYPE_TAG = "com.symbol.datawedge.simulscan_region_type"; Returns the region type of the bundle object for reach region. Region type is a string and is retrieved by calling Bundle.getString (). Picture - Region is a picture; data is in JPEG format. Form - Form type to specify that the bundle contains a picture of the captured form. Form image is in the JPEG format.